Frank_Wx wrote: Piggy-backing off my posts above the models continue to show what would be a blast of fall-like temps into the area late September into early October. 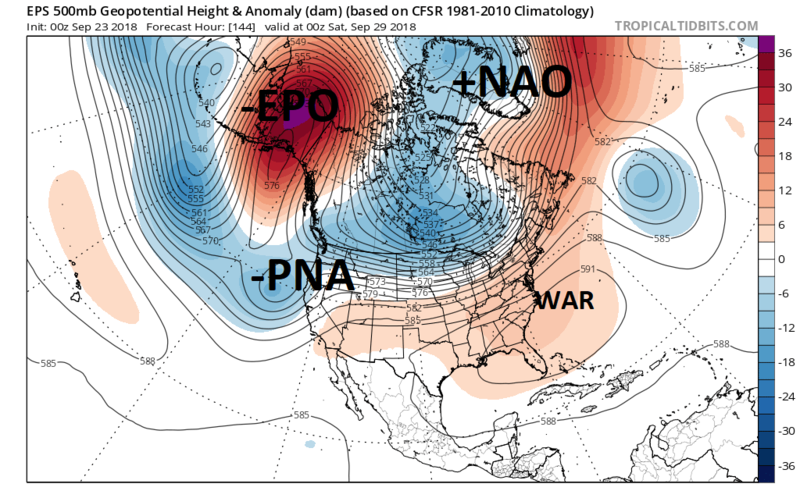 The -EPO/+PNA forces a trough over the east. It will be interesting to see how long the trough will hold over the east. I think the period between September 28th (+/- 2 days) and October 4th (+/- 2 days) will feature below normal temps. How long it lasts remains to be seen. Most likely, this time of year, it is transient. 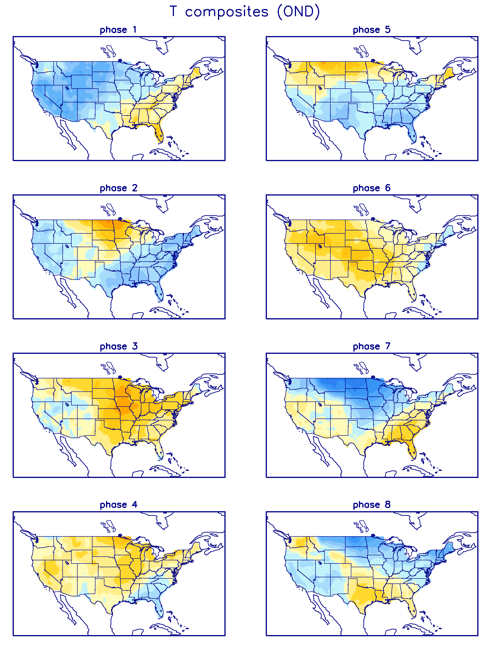 Here is the EPS and GEFS for the Sept 29th time frame(same map Frank posted from a few days ago). As you can see the 500mb evolution is to temper the troughing expectations into the EC as we get in closer with the warmth still pushing back. As you can see the -EPO is a key player in driving some exceptionally cold air into central Canada, but the PNA region is neg; not positive, and the WAR is fighting back. Result is a trough that swings through the region cooling us off but the warmth returns behind it. I would have to agree with Frank here in saying that these cool shots and troughing into the Easten third of the country are coming; however, IMO for now they will most likely be transient, but could be frequent. On the heals of the cool shots, like Mugsy posted above regarding the SSTA off the EC, the western Atlantic ridge (WAR) will still flex; therefore, I do believe the warmth will likely balance out the cool such that when we look at the temp anomalies over the next 2-4week stretch in hindsight they will likely be around N to maybe slight above normal. In the tropical thread I had mentioned that there was an MJO pulse coming out into phases 8-1 with some decent amplitude. As you can see below that is still the case. Some of you might hear phase 8-1 and think heck these are usually great phases for cold into the east. In November though March you would be correct; however, at different times of year the phases of the MJO behave differently due to seasonal variations. 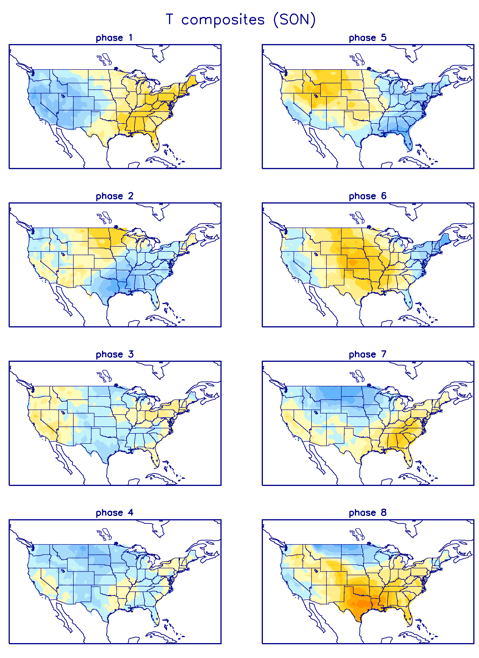 Below are the temperature composites for the MJO phases that correlate with different times of the year. There are 4 images below. . First is August/Sept/Oct (ASO), then SON, then OND, and finally NDJ. Follow the evolution for phases 8-1. 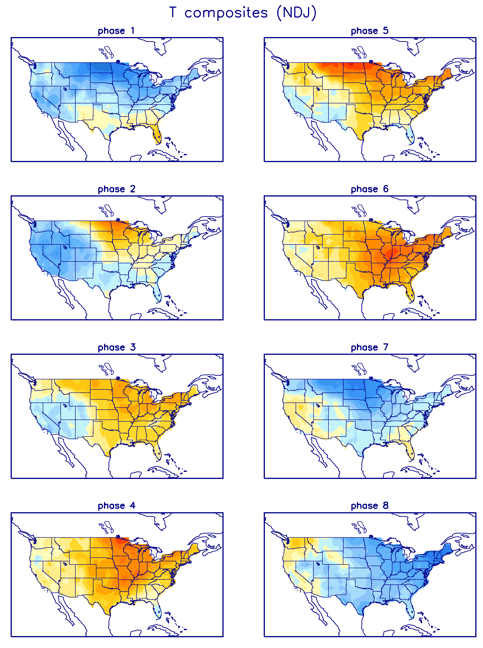 Notice 8-1 are actually warm phases of the MJO in the east until the OND composite when you see the transition to cool for 8 warm for 1. As you head into the heart of winter 8-1 become cool phases throughout. Obv we are still in Sept but close to Oct. So if you avg out the ASO, SON composite we still see that in general we should see overall AN temp anomalies in our neck of the woods when the MJO is in phases 8-1, esp when there is amplitude like the forecast suggests. Ill leave you with one last image. Below is the current global SST anomalies. In general where you see the large areas of warmer anomalies is where you would expect lower pressures due to rising warmer air. The current configuration suggests that if this were to hold into the winter any MJO pulses would likely feedback on themselves in the more favorable phases for cold and snow for the East. 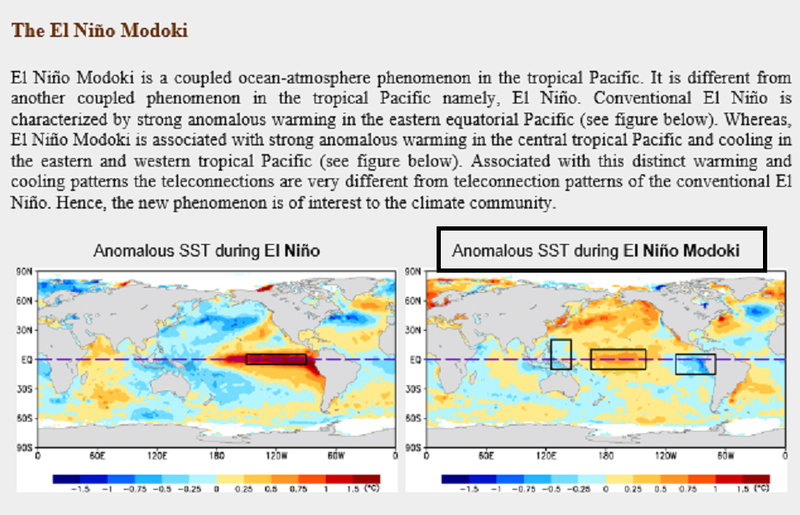 As we sit right now, IF the ENSO region conts to evolve as expected, either weak Modoki el Nino or warm Neutral, and the Indian ocean SSTA configuration doesn't do anything drastically different and the N Atlantic does not drastically alter its SSTA, then IMHO we are in really great (not good) position for the winter season. Between the circle and oval there is a rectangle-in the last image you left us with and not the images from last year-and I see the blue above that rectangle. Is that the Modoki showing up? I hear Modoki and I associate the word “centered”. dkodgis wrote: Between the circle and oval there is a rectangle-in the last image you left us with and not the images from last year-and I see the blue above that rectangle. Is that the Modoki showing up? I hear Modoki and I associate the word “centered”. I added some labels to the image your referring. See the image below then refer back to our current SSA above. This will also help over the tip raise the heights to help form blocking in the AO and NAO regions. Just my observations at this time. Canada is off the charts for snow this September in Alberta province and Hudson Bay is very anamoulously cold, that should freeze by November. The cold and snow in Greenland is extreme as well. This is important to help promote cold as we move forward.he,k even western US mountain regions seeing snows, not rare but a good indication. Remember that low solar, sunspots, equals low radiance which also means much more cloudiness. This will.promote more precipitation and cooler temps. There is a chart that shows this over the tropical equator region and N of 40N. I have to find this online and share, but it is very iteresti g to see the correlation. Also, geomagnetic events will continue to be active like EQ and Volcanoe activities. Well just yesterday I read an arricle.on how 4 Supervcanoes - Iceland, Italy, Peru and south pacific were gurgling some the venting type of gurgling images showing magma starting to build. Could be 100 years before anyone of these blow but interesting to see nonetheless in this cyclenof our planet and sAR system. Out of curiosity, what does Joe Bastardi say about this wintet. I was really impressed with his call on those two cold winters five years ago. 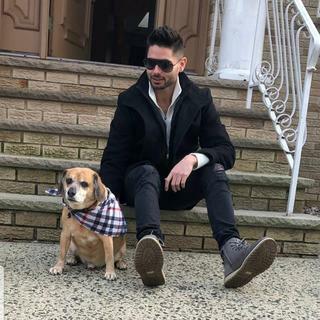 If he is on board, I am moving to FL! dkodgis wrote: Out of curiosity, what does Joe Bastardi say about this wintet. I was really impressed with his call on those two cold winters five years ago. If he is on board, I am moving to FL! He is saying temp are going to be 1 to 3 BN and Snowfall 133% AN. Start packing LOL!! Here are his maps your very welcome!! amugs wrote: Here are his maps your very welcome!! Tallahassee averages 0" of snowfall a year. If I do this difficult math out, 167% of normal is still 0. Parts of this make no sense. Sounds like you may be reading into this a little too deep. On my phone, I thought the JB maps posted by Mugs showed a 1 to 3 degree departure from the average temp. Looking at it on full screen, I see it is predicted actual temp. OK I may stay around for those temps. Why pay high property and school taxes in NY if not for the change of seasons. So no, I do not think I am reading into this too deep, in fact, I am taking this quite literally. I am not disagreeing many forcings are going to be very favorable this winter for the east coast if you enjoy cold and snow; but rather the faulty communication in this map. So if you have a specific backyard that avgs 0.0 but you think this year that location might actually see 1/2-1” how do you propose you forecast that with this sort of lead time? Or let’s say the same location which avgs 0.0” per year and also never even sees snow but you think there is a chance that it snows but never sticks how do you propose you forecast that with this lead time. Maybe your not but it appears from my vantage point you may be reading into a little too deep given the lead time. If you think about this statistically, it's a valid forecast. Using Tallahassee, the statistical bell curve is centered on 0.0". Now, obviously, you can't have less than 0.0", so we are only looking at the positive side of the curve. No matter how steep the tail, there is still a statistical tail to snowfall events. 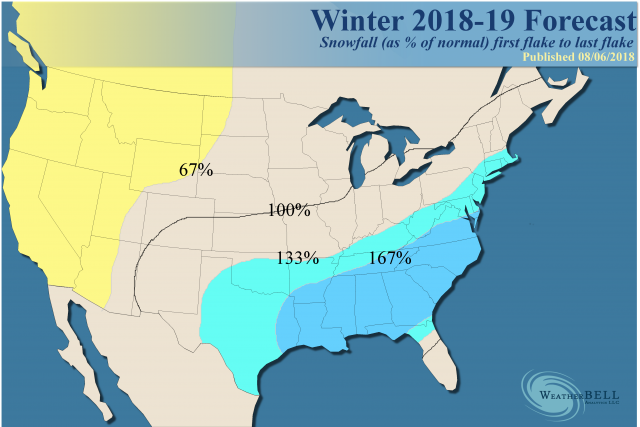 As such, even though 100% of "normal" in this case is 0.0", he is stating that this season's annual snowfall will be 67% greater than "normal". Mathematically, no, you can't make that work you have clearly stated. However, statistically, it is sensical as he is also forecasting a 67% chance of receiving above-average snowfall. Now, if you account for a 67% shift to the right of the statistical bell curve, you are shifting the curve by exactly 1-sigma (fun fact), but as a result of this shift, you can now extract the expected snowfall amount by overlaying this new shifted bell curve over the original statistical bell curve, which willntherefore be a non-zero amount. I tell you one thing with the way the Pacific is looking along with other factors seemingly in our favor, you can move that 167% into our neck of the woods. Looking forward to many late nights of model tracking. Disagree (right now). Niño 1.2 is significantly warmer than either 3.4 or 4 right now, which, if remained the case through the winter, correlates to the eastern ridging fighting back. 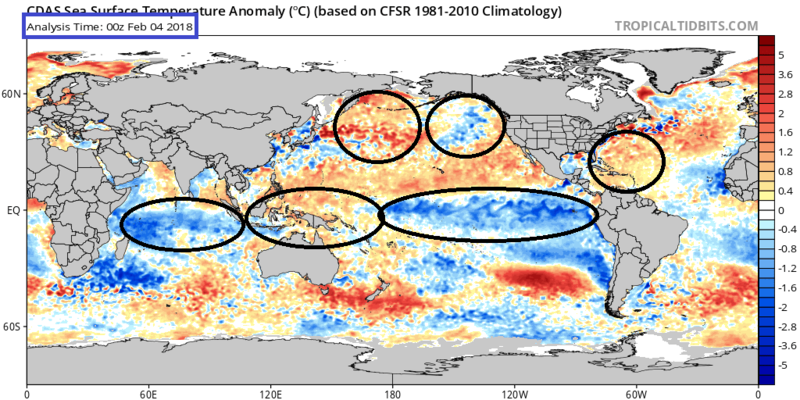 We want the Pacific to look like it did a couple weeks ago where it was clearly warmer in the central tropical Pacific. That said, there are caveats. For one, the entire Niño signal remains meager, so even if this configuration held it would not be overpowering. Two, it would tend to support MJO convection that remains essentially Phase-locked in phases that favor eastern U.S. troughing, which could help to combat the pure Niño signal (again, IF this all held verbatim to how it is now). However, the MJO would need amplitude, as the Niño signal is larger, and therefore carries more weight. There are, of course, other factors that I cannot discuss at present. In looking just at the factors discussed, though, this setup would likely be one of transience biased warm for our region (verbatim), in my opinion. 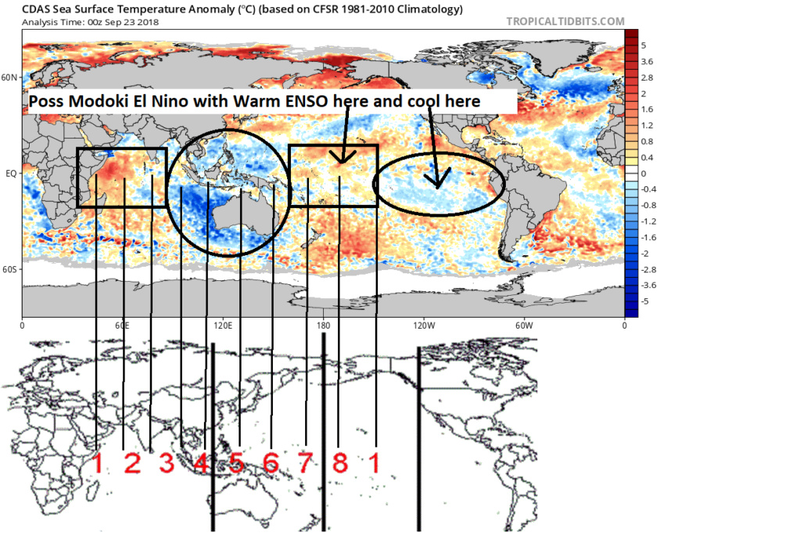 RB I would not put much credence with Nino 1.2 currently being warmer than 3.4. 1.2 has a known bias of being volatile with surface temps in a week to week basis. There is subsurface warmth in 3.4 that will influence that region in the coming days and weeks. Also there is no model guidance suggesting an eastern Nino developing this fall and winter. I do agree regardless of what happens this Nino will most likely be a weak one which will make other weather parameters come to the fore front. The warm blob in the northern Pacific will promote ridging out west which will ensure a trough in the east. Things look to line up in the Atlantic as well as we have a favorable QBO along with a solar minimum which both will help promote a -NAO and -AO. The only fly in the ointment is a stubborn western Atlantic ridge that remains persistently strong. All in all I'm very confident of an upcoming cold and snowy winter. Thanks for the disco. While this is a "petty" disco on effective communication, I ran the numbers to prove you are in fact correct but doesn't take away from my original point. The final 1-sigma value is .3717 inches, the mean through the recorded history is .0738 inches. Thus, I am forecasted to receive a rather large sum of snowfall this winter. 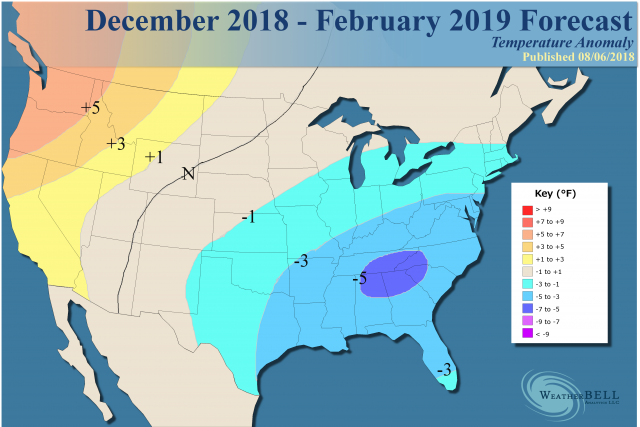 Revisiting this post because there are clear signs at this lead time that the cold will not be as pronounced as originally thought. The trough is clearly there in southern Canada but there is no mechanism to drop it south into our region. The warm SSTA's in the Atlantic this time of year will give the SE Ridge or WAR more power than any early-reason trough that tries to come this way. 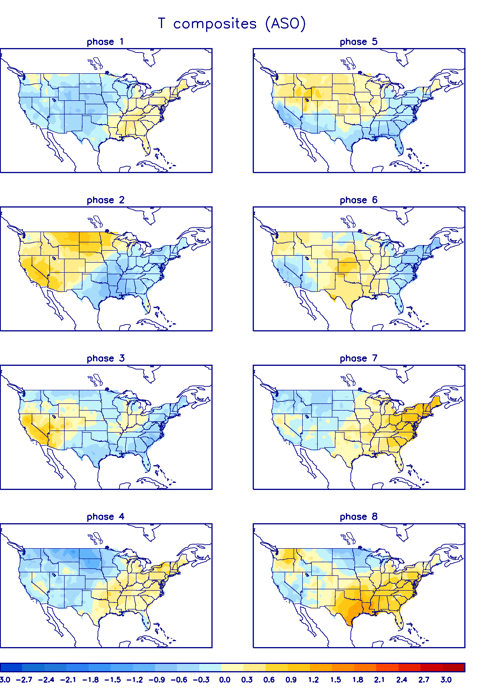 The GEFS and EPS suggest we'll remain above normal temperatures through the first week of October. Honestly not a whole lot happening weather-wise in the long range. In general by what approx date is the first frost? I have a selfish reason. I want to get rid of crab grass.